What is China doing down there? Truth is, we don’t know for sure. Flying high in the skies above Antarctica’s ice in late 2016, the former head of the Australian Antarctic Division was on a spectacular mission. The Antarctic Treaty System bars military activity or mineral exploration and it is up to scientists like Nicholas Gales to ensure their neighbours are doing as they should. His goal that day was to complete the first inspection of the remote American base at the South Pole by a nation unaided by the Americans themselves. “We flew in under our own resources with one of our chartered ski-equipped aircraft, a Basler,” he told a parliamentary committee less than a year later. This was the only inspection of another station Australia has undertaken in the past eight years. While getting to the South Pole was an achievement, of perhaps greater significance was the base Dr Gales didn’t visit. All up, China’s most audaciously located station — at the high point of Antarctica’s vast ice sheet at the heart of Australian Antarctic Territory — has seen 10 summers. This is a decade marked by incredible expansion of Chinese activity. Yet this station, as well as one another Chinese base within Australia’s claim, have never been inspected. Many are saying it’s time for a check-up. ​Updated Thu 28th March 2019. Dr Cathryn O'Sullivan learnt that when she was involved in an accident more than 3,400 kilometres from Hobart and was worked on by tradies. "Because there's only a single doctor and they're isolated over winter for up to nine months, we actually ask the doctor to have their appendix out before they go," the Australian Antarctica Division (AAD) chief medical officer Jeff Ayton said. "We're working in an extreme environment, we're using machinery and things like that. "So people generally are having things like slips, trips and falls and minor injuries — all can be dealt with by the single, lone, rural generalist-type doctor that is common around Australia." In 2015, Dr O'Sullivan made her first trip to Antarctica. She was to be the sole generalist doctor at Casey Station. However, after a minor car accident, she was the one in need of medical attention. ​"In the real world, it wouldn't have been a drama, but I broke a bone in my hand, and unfortunately the type of fracture it was, it was quite out of place and it needed to be put back into place," she said. It was the middle of winter, which meant an evacuation was not an option. The fracture was in her dominant right hand, which meant she could not treat herself. But advances in technology meant she could get expert advice. She had a tele-health hook-up with a Hobart hand surgeon who was able to diagnose the severity of the injury, determining the fracture would have to be treated in Antarctica. Although Dr O'Sullivan was the only doctor on the base, she was not the only one with some medical training. "In Antarctica, we have what are called lay surgical assistants, and these are four usually tradesmen or technicians who are down in Antarctica doing other jobs, the plumber, the electrician and so on," she said. "They are given two weeks of training at the Royal Hobart Hospital on how to be lay surgical assistants, so how to assist the doctor in a surgery, or if someone was unwell and needed medical care." She had also carried out her own monthly training sessions with her tradesman students. "As we were halfway through the year, I had trained them already in putting plasters on, and I'd showed them the X-ray system," she said. With Dr O'Sullivan out of action, the tradesmen were tasked with "quite a specialist medical procedure" under the guidance of an anaesthetist and hand surgeon. The experts were both watching the procedure and monitoring her vitals like her blood pressure and heart beat through a live video link-up back in Hobart. As Dr O'Sullivan recalled, they had to first inject anaesthetic into her wrist to bathe two nerves so that her hand became numb, and then were able to put the bone back into place, plaster it up, and take X-rays that were beamed instantly back to Hobart to be assessed. Her hand has recovered fully, and she saw out her time at the base. Australian researchers have discovered huge underwater lakes beneath the largest glacier in east Antarctica. 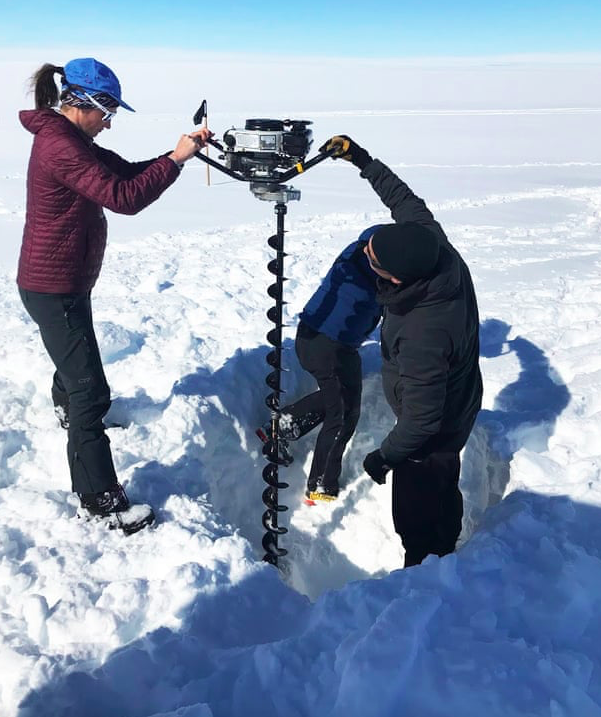 The lakes were detected by scientists setting off small explosives 2m below the surface of the Totten glacier and listening to the reflected sound. The Australian Antarctic Division glaciologist Dr Ben Galton-Fenzi said the research was critical to helping scientists predict how the melting of Antarctic glaciers would change the world’s oceans. The Totten glacier is 30km wide and up to two kilometres thick, and has the potential to raise sea levels by seven metres. He said the speed glaciers travel at is determined by what they move across. If there’s bedrock under the glacier, it’s sticky and will move more slowly, but if there’s water or soft sediments, the glacier will move faster,” he said. The search for Sir Ernest Shackleton’s lost ship, Endurance, has been called off after extreme weather trapped an underwater vehicle under a sheet of ice. Explorers working on the Weddell Sea Expedition had hoped to find the Antarctic explorer’s vessel, which was crushed by ice and sank in 1915 during his ultimately unsuccessful attempt at a land crossing of the continent. But severe weather closed in and the sea ice conditions led to the loss of the team’s specialist autonomous underwater vehicle, the AUV7. The team was using the AUV7 to locate the wreck using HD still colour cameras. They were on the final leg of their mission when the vehicle went underneath a vast sheet of floating ice and lost contact with the research vessel, the SA Agulhas II. The team tried to recover the AUV7, but eventually decided to abandon the mission because of the risk they too might become trapped in ice. Any captured footage there may have been of Endurance on the seabed was lost. The AUV7 had conducted what is believed to be the longest and deepest dedicated under-ice survey ever, lasting over 30 hours. “The Weddell Sea Expedition team are truly disappointed that after such a huge effort, and overcoming several major setbacks, we have not been able to find Endurance,” said Dr John Shears, a polar geographer and the expedition’s leader. “We are, however, very proud of our other achievements over the past weeks in Antarctica. We have greatly surpassed our primary expedition objective of undertaking pioneering scientific research at the Larsen C ice shelf. Shackleton’s attempt to cross Antarctica began in 1914. Shortly after the vessel left the island of South Georgia, it encountered ice and became trapped for 10 months before sinking. The explorer and his crew survived for six months before reaching the uninhabited Elephant Island. Shackleton and five other men then set off to seek help at a whaling station on South Georgia. After three unsuccessful attempts, he finally rescued his men in August 1916. The Weddell Sea Expedition team said it may attempt its mission to find Endurance again. Posted ABC website 23rd January 2019. ​To access article and video click here. China's only icebreaking research ship has been showered with 250 tonnes of ice and snow after hitting an iceberg in the South Pole, breaking the ship's mast but injuring nobody on board. The MV Xue Long, which translates as Snow Dragon, was moving through the Amundsen Sea in "dense ice" when it struck the iceberg, China's Ministry of Natural Resources said in a notice posted on its website. "During the voyage, due to the influence of dense fog, it collided with the iceberg," the ministry said. The 20,000-tonne Snow Dragon was travelling at a speed of around three knots (5.56kph) at the time. Footage shown on Chinese state television showed personnel using pickaxes, hoses and pulleys removing huge amounts of ice from the ship after the accident. Part of the Chinese icebreaker Snow Dragon covered in snow and ice, after the vessel hit an iceberg. The Ministry said the ship's bulwark and mast were damaged, but that everyone on board was safe. It said the ship's engine, power, communication and navigation equipment are all operating normally. The research vessel was on its 35th Antarctic mission at the time of the incident. It was built in 1993 in Ukraine, but has had considerable upgrades over the years. A second icebreaking research ship called the Snow Dragon II is set to be completed later this year, and will be the first to be built in China. China has been increasingly active in Antarctica over the past decade, with three bases, two field camps and three airfields on the continent. 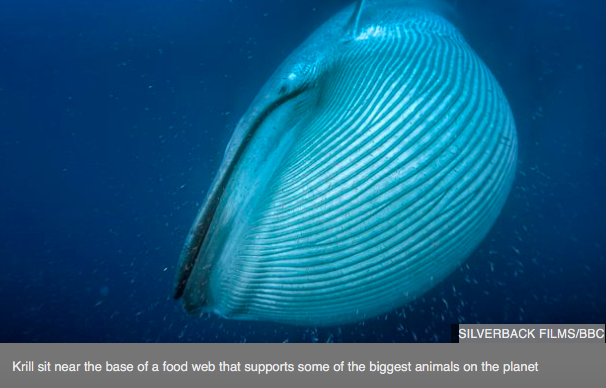 It focuses on the Scotia Sea and the Antarctic Peninsula - the places where the crustaceans are most abundant. Scientists have been gathering data in these areas since the 1920s. We would like to invite you to a special AAD seminar presented by A/Prof Nathan Daczko from the Department of Earth and Planetary Sciences at Macquarie University. Nathan’s research interests are varied and include structural geology and tectonics, metamorphic petrology and thermobarometry, evolution of plate boundaryzones, integration of geological and geophysical data, geochronology, and field mapping. The most poorly exposed and least understood Gondwana-forming orogen lies largely hidden beneath ice in East Antarctica. Called the Kuunga orogen, its interpolation between scattered outcrops is speculative with differing and often contradictory trends proposed, and no consensus on the location of any sutures. While some discount a suture altogether, paleomagnetic data from Indo-Antarctica and Australo-Antarctica do require 3000–5000 km relative displacement during Ediacaran-Cambrian Gondwana amalgamation, suggesting that the Kuunga orogen sutured provinces of broadly Indian versus Australian affinity. Here, compiled and new data from detrital minerals offshore of East Antarctica fingerprint two coastal subglacial basement provinces between 60 and 130°E, one of Indian affinity with dominant ca. 980–900 Ma ages (Indo-Antarctica) and one of Australian affinity with dominant ca. 1190–1140 and ca. 1560 Ma ages (Australo-Antarctica). This offshore compilation is combined with existing and new onshore mineral isotopic character and previous geophysical interpretations to delimit the Indo-Australo-Antarctic boundary at a prominent geophysical lineament which intersects the coast east of Mirny at ~94°E. This research will lead to improvements in plate tectonic models for the amalgamation of Gondwana. Please join us in the AAD theatrette on Thursday, 24 January, at 10:30 am. We are looking forward to seeing you there!! A British army officer has set the record for the most expedition miles covered in Antarctica, after becoming just the second person in history to trek unaided across the frozen continent. The 925-mile mission, along with his previous expeditions to the continent, means that Capt Lou Rudd, 49, surpassed a total of 3,000 miles of human-powered travel in Antarctica. The father of three from Hereford finished the gruelling endurance race in 56 days on Friday, two days after the US explorer Colin O’Brady became the first person in history to cross the continent unaided. Rudd, a motor transport officer based at the Infantry Battle School in Brecon, Wales, said he was delighted to have finished the expedition, which he undertook in memory of close friend and explorer Henry Worsley, who died from exhaustion just 30 miles short of completing the record solo crossing in 2016. He said: “My number one priority and objective was to come out here and ski solo, unsupported and unassisted right across the continent and I’ve done that. That was always the primary objective. 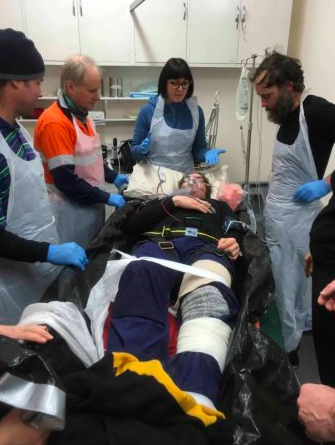 Rudd hauled a 140kg sled through 60mph gales, temperatures below minus 30 degrees celsius and over sastrugi – wave-like ridges created by wind – surviving off a grazing bag of chocolate, nuts, cheese and salami. “What matters most to me is that I’ve completed my expedition – and honoured Henry’s memory by carrying his family crest across Antarctica. I know he would have appreciated that. That’s what is really important to me. The army officer documented his Spirit of Endurance expedition in blog posts since he began on 3 November, which saw him describing his coping methods during the brutal journey such as a Winston Churchill audiobook and a 1980s music playlist.